As tattooing has continued to increase in popularity, the number of people who then choose to have those seemingly-permanent inkings removed from their skin and banished to memory. Nothing to do with the quality of the tattoo itself, of course, but more a natural consequence. After all, it makes sense that more tattooed people = more people changing their minds down the line = more removals. Now back in days of yore, those folks who wanted to be rid of their ink had to suffer techniques such as dermabrasion, simply cutting the tattooed skin off or simply living with the indignity of having a Tweety Pie smoking a cigar on their left shoulder blade forever. 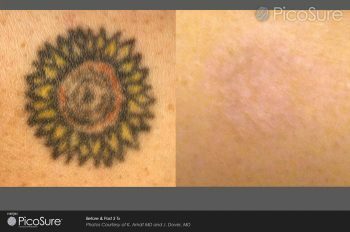 Fortunately, methods of tattoo removal have advanced significantly since then and now even the previous go-to Q-switch laser is on the verge of being past it. While this technique uses thermal energy (heat) to break up the ink particles that constitute the tattoo, a new kid on the block promises to do an even better job. That kid is Picosure. Picosure needs no heat to do its job; instead, the Picosure system hits the ink particles with short, powerful pulses that simply shatter the ink particles into such tiny pieces that they can then be simply reabsorbed by the body. While Q-switch is famous for producing relatively quick, painless results with minimal scarring, Picosure is so effective that you’re guaranteed a cleaner result in less sessions. It even works on stubborner blue and green inks and tattoos that have previously failed to respond to treatment. Pulse Light Clinic is thrilled to offer Picosure laser treatment to anyone who wants to remove a tattoo. Call in for a consultation today and we’ll be happy to help in any way we can.